Argentina was elected the host country of Specialized Expo 2023 by the 170 member states of the Bureau International des Exhibitions (BIE) during its 162nd General Assembly which took place November 15, 2017. Beating out two other candidates for the slot – Lodz (Poland) and Minnesota (USA), Expo 2023 Argentina Buenos Aires will be the first BIE sanctioned international exhibition held in Latin America. James Ogul is world’s fair editor of InPark and spent his career administering world’s fair pavilions for the US Government. He continues to consult on world expo pavilions and projects. Read his free book, Tales from the Expo. Specialized Expos as we know them today are a category established by the BIE in 1988. They are global events, thematically dedicated to specific challenges, such as ocean protection (Expo 2012 in Yeosu, Korea) or the future of energy (Expo 2017 in Astana, Kazakhstan). They take place between the larger, six-month World Expos which take place every five years. The world expos have broader themes – such as Milan 2015, which had a food-centric theme – and many participants design and build their own unique pavilions. Specialized expos are smaller in size, run for three months, and participant countries don’t build their own pavilion structures, but establish their exhibits within expo-provided buildings. 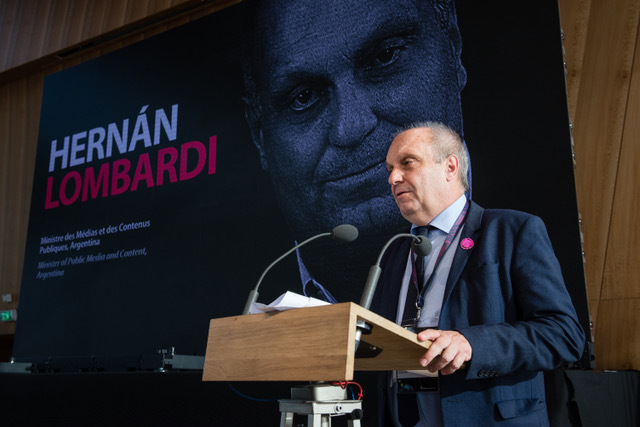 For this exclusive story on preparations for Buenos Aires 2023, InPark expo specialist James Ogul interviewed Mr. Hernan Lombardi, Argentina’s Minister of the Federal System of Media and Public Content (photo at top). What can you tell us about national support for the Expo and your general goals as organizer and host? Since winning the bid to host Expo 2023, by election at the BIE General Assembly (November 15, 2017), the government has continued its work in order to meet the high expectations that this historic opportunity for Argentina and Latin America has raised inside and outside the country. We are not alone. We have the support of the local communities, a very important development bank, international organizations and the most relevant Argentinean and international companies that accord with our expo theme, Creative Industries and Digital Convergence. The subject is permanently part of the present agenda of President Macri and his Cabinet. Hosting Expo 2023 will stand as a high and enduring honor for Argentina. We are thrilled to be given the opportunity to make the commitment – not only to achieve a successful result, but also to create a landmark in the history of Expos. We expect to organize and host an unforgettable event for the public, the participant countries and the whole international community. How is the Expo project being organized? The whole Argentinean government is committed to this inspiring challenge. The main responsibilities are being carried out by a task group directed by the Chief Cabinet of Ministries, with a core formed by six Ministries, assisted by other Ministries and by universities as well as specialists with background in this type of massive event, and in master planning and legacy matters. We are committed to making the best possible master plan, so that the Expo site works efficiently and supports a sustainable legacy plan to take effect after closing day. We expect Expo 2023 Argentina Buenos Aires to have a relevant and lasting impact in the life of the area, the region and the country. World renowned architects and specialists are being consulted regarding this goal. Argentina is constantly working to get to 2023 with a solid enterprise in terms of organization and theme. How many countries do you forecast will participate? Every day we receive more and more confirmation that the theme of the Expo is timely for all the purposes characteristic to this unique type of event: education, innovation, cooperation; creating new bonds between nations and their cultures while also entertaining the public and worldwide audiencies with high quality content, activities and shows. Every step we are taking is headed in that direction. Our expectation is to welcome the participation of more than 100 countries. Tell us more about the steps and initiatives currently in place as Argentina prepares to host Expo 2023. I would like to mention that the Expo 2023 organization has been developing initiatives to fulfill important matters, such as defining the legal form of the Organization in charge of the Expo in the short term. The creation of the organizational structure will be announced at the end of 2018. What is your attendance forecast for the event? The number of visits to Expo 2023 is estimated at 9.4 million, as a result of the arrival of 6.1 million individual visitors who will attend the exhibition 1.55 times on average. As for specific visitors, 79% of demand will come from day- trippers while 17% will come from national tourism and 4% from international tourism.